Financial statements projections and forecasting are very common in corporate financial analysis. The reason is that it is very useful and important to forecast how much financing a company will require in future years. The projections are achieved by using historical sales, accounting data and assumptions on future sales and costs. These financial statements projections are known in financial modeling as Pro Forma financial statements. 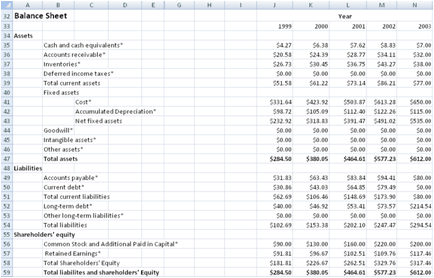 This spreadsheet provides a template for financial statements forecasting. It requires simple financial statements inputs from the past 5 years and will automatically generate all the necessary Pro Forma Financial Statements projections outputs. The following diagram illustrates the process of using this template for financial statements forecasting. Most inputs are required in the first step. The rest of the four steps involve reviewing the outputs generated and entering values like short term interest rates to be assumed in the model. The template requires inputs from the Income Statement and Balance Sheet from the past 5 years. All inputs are marked with the "*" symbol. The fields that are automatically calculated as shown in bold below. The Total liabilities and shareholders' Equity field is worth noting. It is set to be equal to the Total assets in the spreadsheet. The Common Size Financial Statements express all the fields in the Income Statement and Balance Sheet as a ratio over Sales. By expressing the fields in ratio, a standardized financial statement can be created to reveal insights and trends of companies. It will be easy to compare financial statements of different size companies or the same company at different times. For example, a company may have grown to be very large over the years. An average of the past 5 years percentage is also calculated. This average will be useful for projections and forecasting of future financial positions. The main inputs in the Financial Statements Forecast worksheet are the Short term and Long term debt interest rate. By default, The Sales Growth Rate, Tax Rate and Dividends payout ratio make use of the average value for the past 5 years. Adjustments can be further made to these figures for better accuracy in forecasting. This worksheet outputs the different financial ratios calculated from the Income Statement and Balance Sheet from the other worksheets. 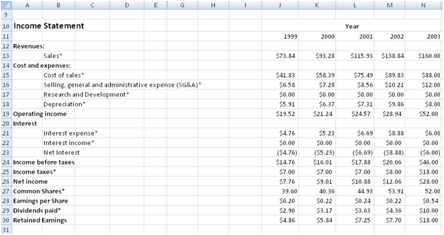 The Share Price for the different years is the only input in this worksheet. Using the Share Price and information from other worksheet like assets, liabilities, cash and costs, the different ratios are calculated. The liquidity ratios provide information about a company's ability to repay its short-term debt. The leverage ratios provide information about a company's long term solvency. The leverage ratios focus on the long term as compared to liquidity ratios which focus on the short term. The profitability ratios provide information about the success of the company at making profits. Receivables turnover provides information on how quickly a company collect its accounts receivables. Inventory turnover provides information about the number-of-days worth of inventory on hand. A low turnover may point to a situation where overstocking has occurred. Asset turnover ratios provide information on how efficiently a company utilizes its assets.